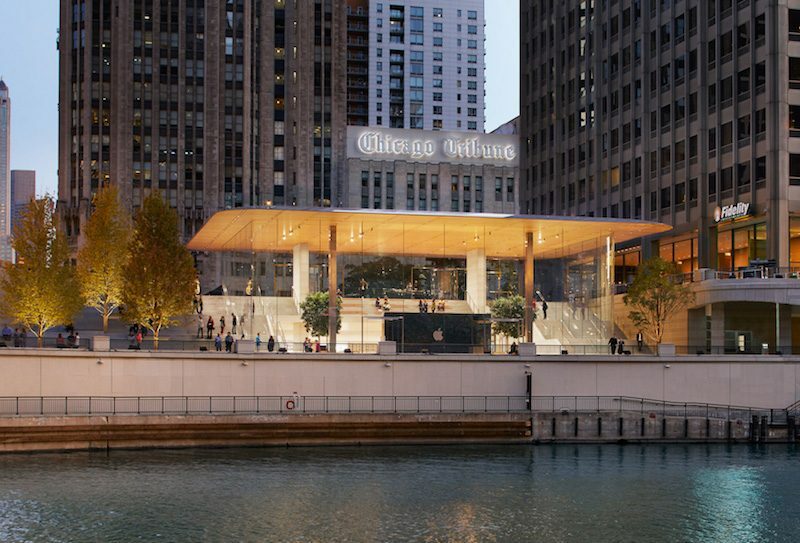 Apple today previewed its new Michigan Avenue store along the Chicago River ahead of its grand opening on Friday. 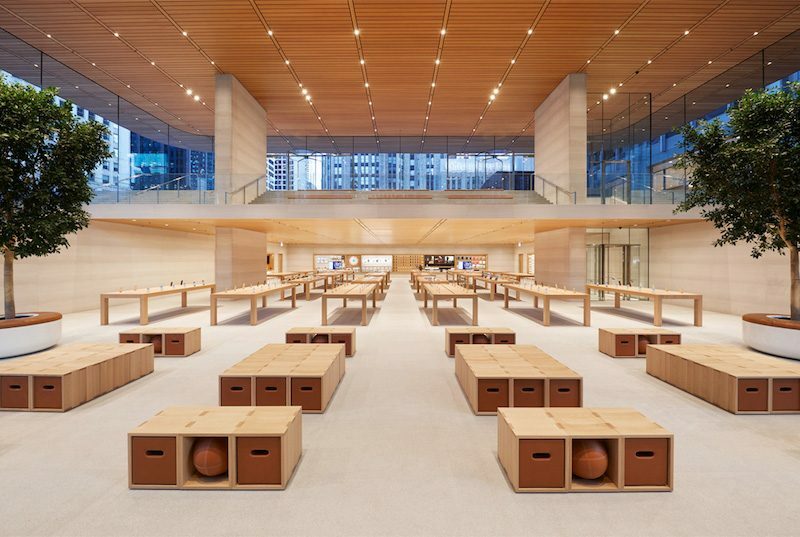 Apple shared new pictures that provide a look at the store's 32-foot glass facades and 111-by-98 foot carbon-fiber roof. Two staircases lead to the store's lower level, featuring indoor trees and a seating area for Today at Apple sessions. The flagship store is designed to create a new connection between North Michigan Avenue, Pioneer Court, and the Chicago River. 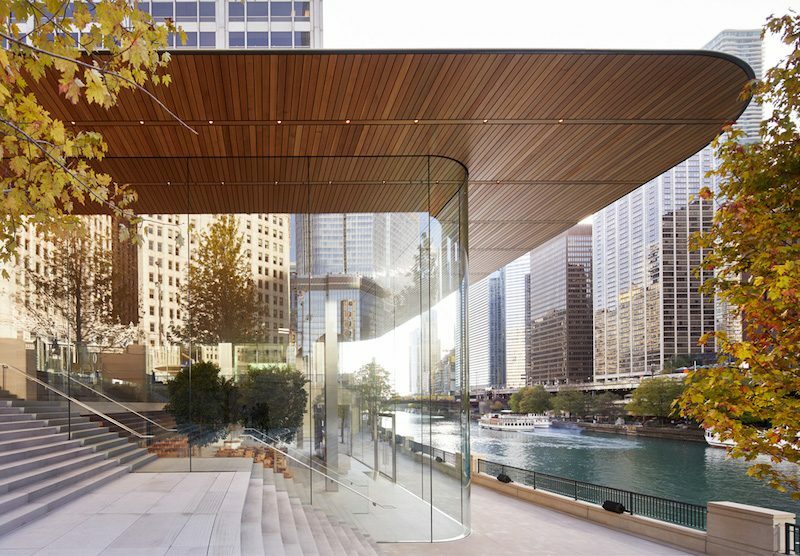 "Apple Michigan Avenue is about removing boundaries between inside and outside, reviving important urban connections within the city," said Jony Ive, Apple's chief design officer. "It unites a historic city plaza that had been cut off from the water, giving Chicago a dynamic new arena that flows effortlessly down to the river." The store was designed by Apple's longtime architectural partner Foster + Partners, and pays homage to architect Frank Lloyd Wright's Prairie Style homes in Chicago. Based on plans from 2015, the building spans 20,000 square feet and replaces a vacant food court. The store took over one year to construct. A lengthy staircase leads from street level to a walkway in front of the store. The building will also be accessible via elevator. On Monday, the store will also launch "The Chicago Series," a set of five programs, each with a different area of focus at the intersection of technology and liberal arts, hosted over the course of four weeks. Apple said each program is co-created with local non-profits and creative organizations. Apple retail chief Angela Ahrendts is in Chicago today and tweeted a picture of herself alongside some of the store's employees. "Apple Michigan Avenue exemplifies our new vision where everyone is welcome to experience all of our incredible products, services and inspiring educational programs in the heart of their city," said Ahrendts. Apple Michigan Avenue opens Friday, October 20 at 5:00 p.m. local time. The store is located in Pioneer Court at 401 North Michigan Avenue, next to the Michigan Avenue Bridge in Downtown Chicago. Apple said its original North Michigan Avenue store, which was its first flagship location, welcomed more than 23 million visitors since opening in 2003. The store, just down the street from the new one, permanently closed today. Apple has nearly 500 retail stores around the world that collectively welcome over 500 million visitors per year. How about reviving important computer products? They need to stop with these ********, hyperbolic, self inflating statements. Reviving urban connection. Please, Chicago is a world-class city. What are you reviving over here? Here's an idea. Let's revive the battery life under iOS 11.
ah more Ive shenaniganry. it's a store. it's got nothing to do with culturally bringing anyone together. Johnny Ive is notorious for saying a lot of pretentious sounding words that have absolutely no meaning behind them. it's just who he is. Hey... watch it, buddy. This is not a store. It's a town square... or is it town center... or maybe town centre? Either way... it's more than a store, for sure. You don't go there to buy stuff. You go there to be amazed and delighted. Jeez... get it right already. Apple stores are a beautiful variant on the city (and mall) landscapes. As a stockholder, I fully support the money and time spent to create these edifices, as they soothe the mind, and make people feel happy to come in. At least that's what I observe when seeing the Apple Stores in person. This store has done nothing but confirm my bias towards them. I think you're confusing the store with a church. It's a store. Nice store, but a store. Nothing more. Angela Ahrendts is the epitome of what is wrong with Apple. Are you going to buy the Apple watch 3 because of the store, or the freakin battery life and LTE. Are you going to stay with iOS because of it's utility and ease of use, or is Android's personal assistant so much better than siri that it's actually a feature you want to switch over. Things like this Apple consumers question them selves. Apple has made a bunch of money, and is wasting it on the likes of Angela who ADDS NO value to the Apple ecosystem. This is just another bad Tim Cook decision. Can't wait till a Apple has a real CEO again. p.s Store is nice. Personally, you could plate it with gold but it wouldn't make up for crappy siri, dongle galore, and products that reduce functionality for design. I hope Angela release the next killer innovation from Apple, the islab. A tablet with no screen, just a slab of the best polished Aluminium in the world - best fashion accessory too! it reminds me of an interview he did (which has gone burried, can only find the reports of the interview now) where he went on a minute rant about how amazing the new technology in the Watch display is, and how it's unique and a bunch of other superfluous words. Ive is a (pardon the vulgarity), Verbal Masturbator. He likes to talk in circles to hear how awesome he sounds. It's done intentionally to provide elevated feelings for Apple products, as somehow above and beyond anything anyone can ever muster, while not actually claiming or stating something that could be legally misleading. über-pretentious store descriptions, as if it were a gourmet dish at some trendoid restaurant. It means that the Chicago River Walk use to have many stores and restaurants and now its not even used. This is definitely a big step.